Yes, more reading. Take note: Journalism is full of it. If you are easily bored by words then this probably isn't the career for you. 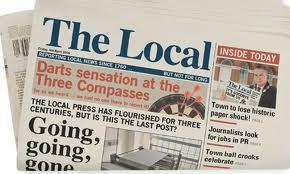 Even if you are pitching up at the local rag for a week of work experience read the paper beforehand. For just like the nationals you should get a feel for the style of stories and the writing. I lost count of the number of students who walked into the newsroom who hadn't even bothered to read the newspaper they were about to work on. Let's put aside sheer curiosity for just a second - surely research must play some part in this? Apparently not. And again, we are not talking about schoolchildren cajoled into burdening offices up and down the country on work placements - these are students who, say at least, they want to become journalists. Too many walk into the office and have to be handed the newspaper which they look at as if you've given the instructions to calibrate a spectrophotometer and told them to get on with it. You may not think much of it and, indeed, there is often very little to recommend some of the turgid writing that passes for local newspaper journalism — but there are still some stars out there. So by actually reading the paper itself you will have a chance to figure out what the various reporters do. You can see whose style (presuming there is more than one reporter — not always a given these days) you enjoy. Or perhaps the reporter whose stories are the most interesting, in other words you will have a head start and since a week goes by very quickly you will have saved a considerable amount of time. But more importantly, such is the very low standard of preparation for work experience, that actually reading the newspaper and knowing something about it will put you ahead of the pack. Figure out the roles of the reporters from what they write. See if you can generate follow-ups (see later on in this blog) from their stories that you can take into the paper when you arrive. As we shall see at a later date this can also save some embarrassment. However ignoring all of this as a matter of courtesy and professionalism you should be reading the paper you are about to do work experience with from the smallest weekly to the largest daily.